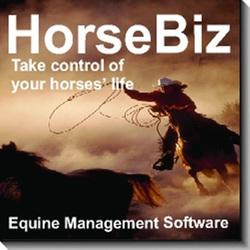 Horse ranch owners, horse breeders, working farms and ranches use HorseBiz, the horse ranch management software program, to manage their horse operations. HorseBiz helps you keep track of breeding activities, feed purchases, farrier visits, veterinarian visits, pedigree history for 5 generations, training costs, show records and awards, miscellaneous activities, inventory items and much more. Owners of all breeds of horses, including: Appaloosas, Arabians, Working Horses, Miniatures, Morgan's, Mustangs, Paints, Donkeys, Quarters or Thoroughbreds find that HorseBiz equine management software meets their needs. Breeders, trainers, working farms, ranches that adopt horses, auction horses, breed horses, care for horses, train jumpers, sell horses, mate or train benefit by utilizing the control features in HorseBiz. If you own one horse or 500 horses, HorseBiz is for you!